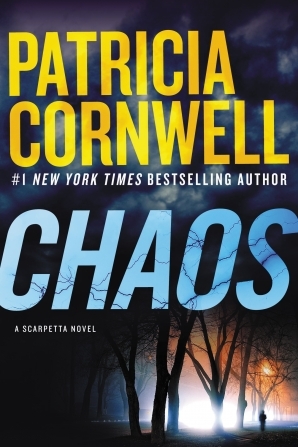 CHAOS by Patricia Cornwell has a “chaotic” plot. This book fascinatingly shows how people are losing control. In some ways technology has made lives easier, while in other ways it has taken away someone’s independence. Cornwell shows in this absorbing thriller how that can happen. Dr. Kay Scarpetta, the Cambridge Forensic Center’s Director, is receiving anonymous poems that are on the bizarre side from a cyber bully known as Tailend Charlie. In her professional life she must find out why two people died after being struck by lightning, including her good friend General John Briggs who has also been electrified. Scarpetta starts to suspect the involvement of Carrie Grethen, her nemesis. She determines that the deaths by “acts of nature” are actually related to this cyber bully, a cunning and technically savvy predator. Dr. Kay enlists the help of her “work husband,” partner detective Pete Marino. They begin a perilous investigation of who is behind the cyber bullying and the murder of the two victims. Her niece Lucy does not play as prominent a role in this book as in others, but she is enlisted to try to find out how this criminal could have access to private information and the ability to use electricity for murder. In this thriller Cornwell shows how Kay balances the demands of her work life with her personal life. Besides having to deal with a cyber bully she has to confront her feelings of sisterly rivalry with Dorothy. The backstory is told of their early life together and why at this time her sister decides to come for a visit.